Edward Cullen might seem an unlikely poster-boy for a Swedish car manufacturer, but it certainly worked well for Volvo. 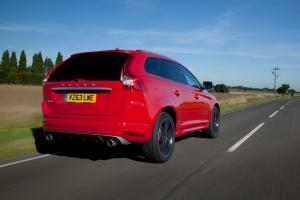 The twinkly-skinned vampire lead of the Twilight films started off with a rakish C30 before upgrading to an XC60 for New Moon. Both might seem an odd choice for a blood-sucker, but when you consider how protective he is of love-interest Bella, it’s not surprising he should opt for something that offers a strong safety record. That’s something Volvos have always been known for. 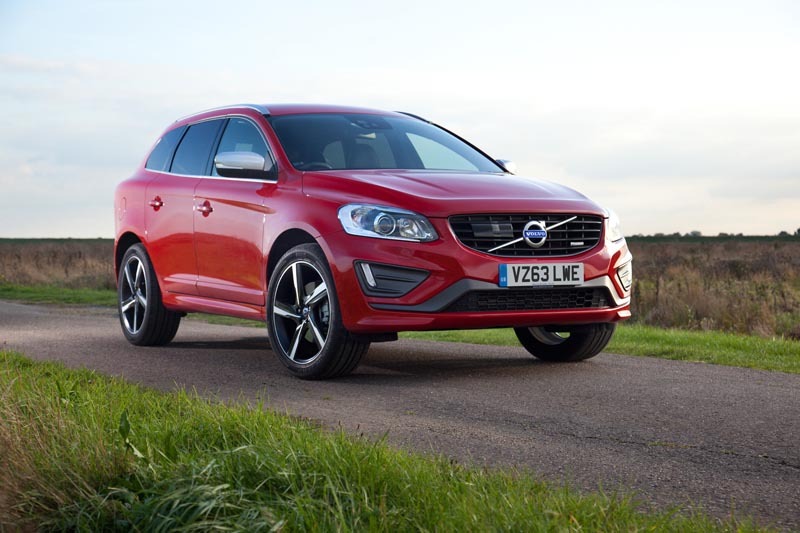 However, the XC60’s job wasn’t to reinforce the same old stereotypes – the XC60 was designed to offer a stronger sense of style; even to attract younger buyers. Ok, so you could argue that Edward is technically 113 years old now, making him probably the oldest Volvo driver in history, but beneath the sparkly skin lies the now-dormant heart of a 17-year old. Even the briefest of glances at the XC60’s taut lines reveal a shape that has little in common with the boxy Volvos of old. Indeed, in R-Design spec, the XC60 is quite visually arresting, with sharp creases, a strong shoulder-line, suggestive twin tail-pipes, and up to 20-inch alloy wheels. The interior is equally appealing, with a welcome simplicity to its lines and a clear focus on the driver. 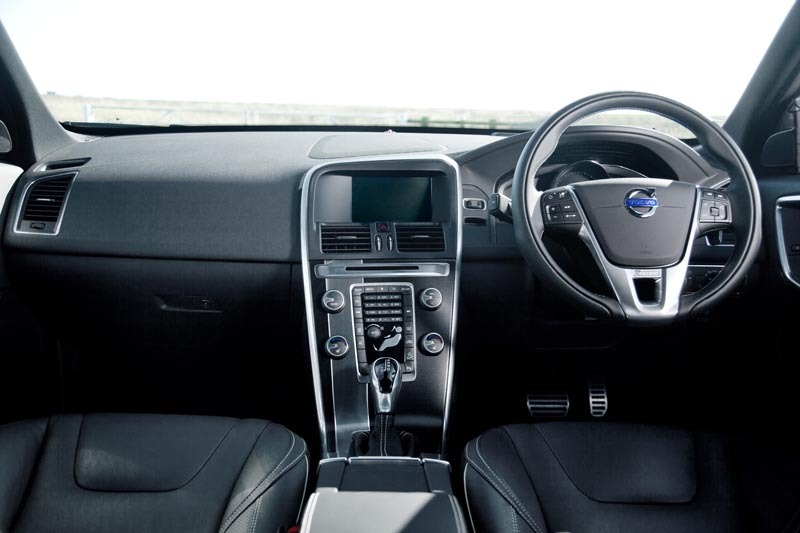 It’s also home to Volvo’s trademark floating centre stack which houses the uber-intuitive climate controls and offers a useful storage space behind it. Above this sits the display for the infotainment and optional navigation system, complete with DAB digital radio and a built-in hard drive to store your favourite music. 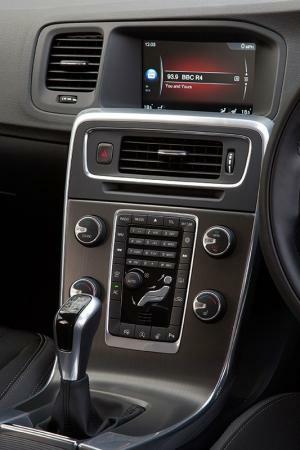 The system is controlled by buttons on the steering wheel, a rotary controller on the centre stack, or by engaging in conversation with the surprisingly efficient voice command system. The system also offers an almost bewildering array of configuration options so you can set up your XC60 just the way you like it, and one particularly neat touch is the inclusion of the owners’ handbook in electronic form so you don’t need to rifle through the glovebox if you’re not sure how something works. The instruments are now entirely digital, using a high-resolution display and a series of rather stylish graphics and animations to keep the driver informed, and there’s a choice of three styles – Elegance, Eco and Performance – to suit your mood. 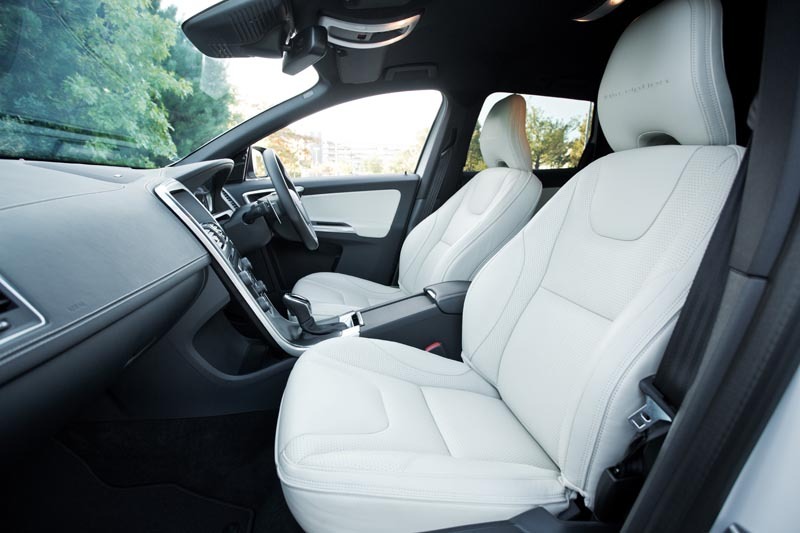 The seats of our R-Design test car feature a particularly attractive combination of nubuck, leather and contrasting stitching, and offer not just plenty of support but also an impressive range of adjustment that should make it easy for drivers of all sizes to get comfortable. Space for rear-seat passengers is good, too, with integrated booster cushions available as an option, although the middle seat lacks the alluring contouring of the outer seats and the high transmission tunnel may lead to some arguments over foot-space. 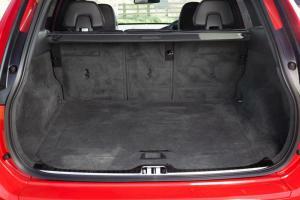 There can be few arguments about the boot, however, the XC60 having been endowed with one of the most practical cargo spaces in its segment, offering 655 litres of space as standard, rising to 1,455 litres with the seats folded. 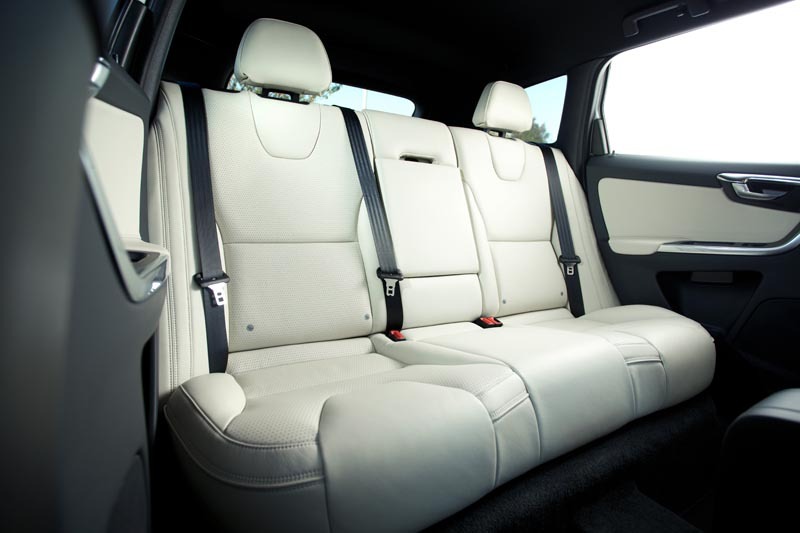 The seats fold in a useful 40:20:40 split that gives the option of carrying long loads and two rear-seat passengers in comfort, and there’s a handy underfloor compartment to keep small items out of sight. 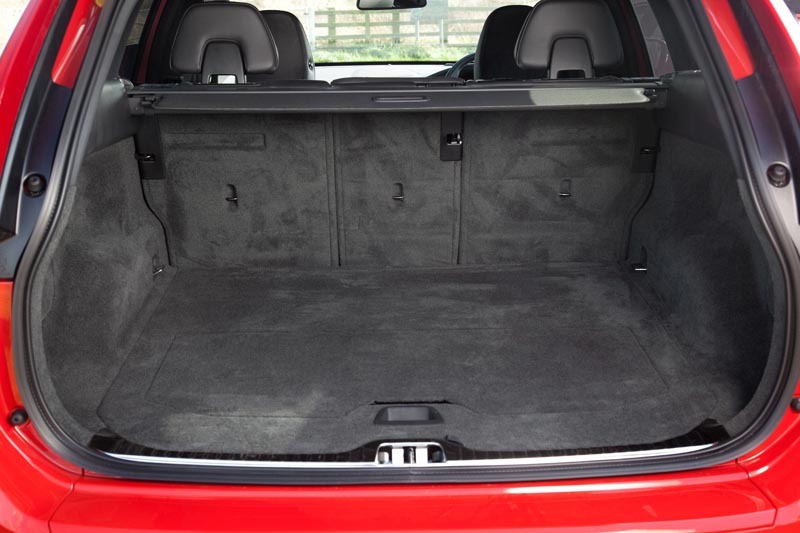 In fact, our only complaint about the XC60’s cargo space is that there’s nowhere to stow the cargo cover when it’s not in use, and a few more hooks and tie-down points wouldn’t go a miss, either. 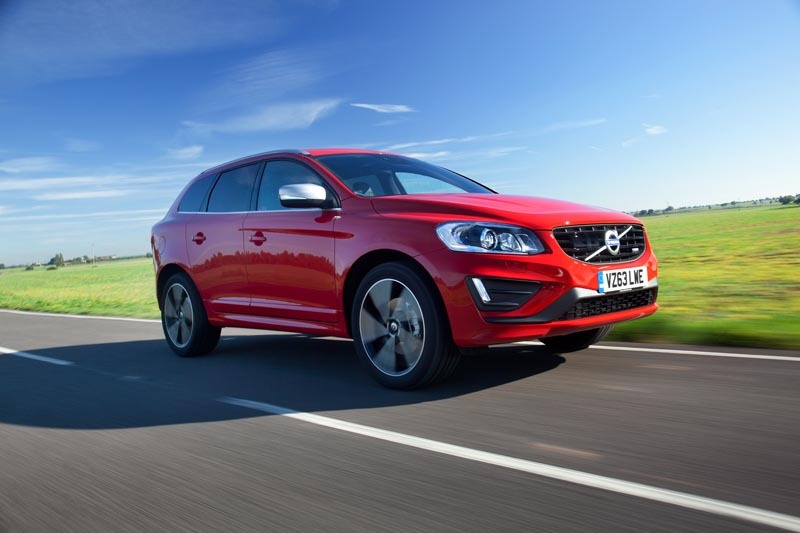 The XC60 is offered with a choice of diesel engines and one high-powered petrol unit, although Volvo’s naming convention can make choosing the right one a little confusing. 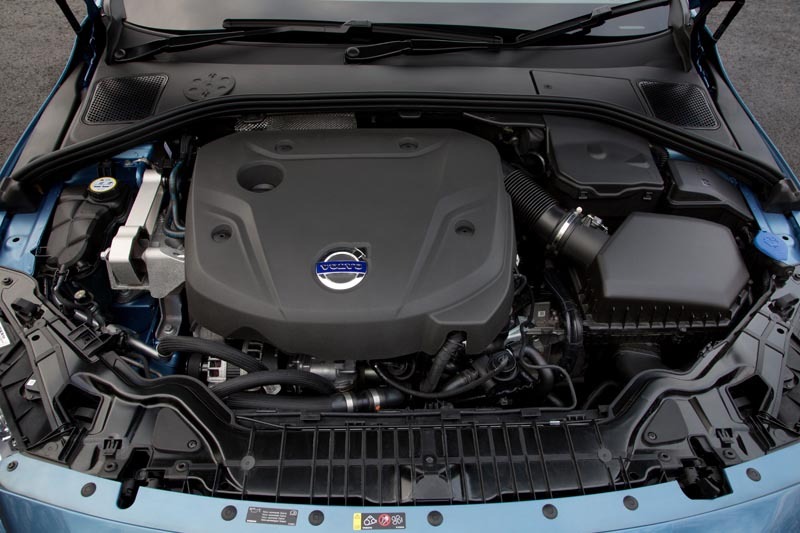 The range starts with the D4, a new 2.0-litre four-cylinder twin-turbodiesel, and the first diesel unit from Volvo’s Drive-E programme. It develops 181hp and a respectable 400Nm of torque, and is mated to either a six-speed manual or a new eight-speed automatic. It’s no slouch, requiring only 8.5 seconds to propel the XC60 from 0-62mph, no matter which transmission it’s hooked up to, but it can achieve this while also recording 62.8mpg on the combined cycle and CO2 emissions of just 117g/km. At present it’s only available in front-wheel-drive form, leaving the all-wheel-drive models to use the existing 2.4-litre five-cylinder unit that – rather confusingly – shares the D4 name, plus a choice of either six-speed manual or six-speed auto boxes. Peak power is an identical 181hp although there’s marginally more torque at 420Nm, and for comparison the five-pot achieves economy of 53.3mpg and emissions of 139g/km. If you fancy a few more beans, the 2.4-litre engine also comes in a D5 version with 215hp – it takes just 8.1 seconds to hit 62mph, yet has identical economy and emissions figures to the AWD D4. Still more beans can be had in the sole petrol model, the T6, which hooks a 3.0-litre six-cylinder engine with 304hp and 440Nm to a six-speed auto, resulting in a tyre-shredding 6.9-second 0-62mph sprint but a fairly scary 26.4mpg and 240g/km. All-wheel-drive models use a Haldex-based system to divert torque as conditions dictate, and there’s a healthy 230mm of ground clearance on offer, too. Our test car was powered by the new D4 unit and eight-speed auto, and it was both pleasingly refined and quick off the mark. Indeed, the automatic gearbox seemed to have an innate understanding of the D4’s torque characteristics, and it knew when to hold a gear to make the most of the engine’s huge wave of torque. A sportier response can be had by knocking the gear-lever across to the Sport position, prompting the ‘box to hold the revs for longer and change gear quicker, while a degree of manual control can be exercised by nudging the lever back and forth to change through each of the eight ratios sequentially. Likewise, the more economy-minded driver can engage Eco+ mode, and this activates a coasting function whenever the driver lifts their foot off the gas pedal while also recalibrating throttle response, turbo spool-up and even the behaviour of the climate control system. While we couldn’t match the D4 auto’s official figure of 60.1mpg, we had little trouble maintaining a 40mpg average during our time with it. With a little effort, a longer journey should return something in the low fifties. 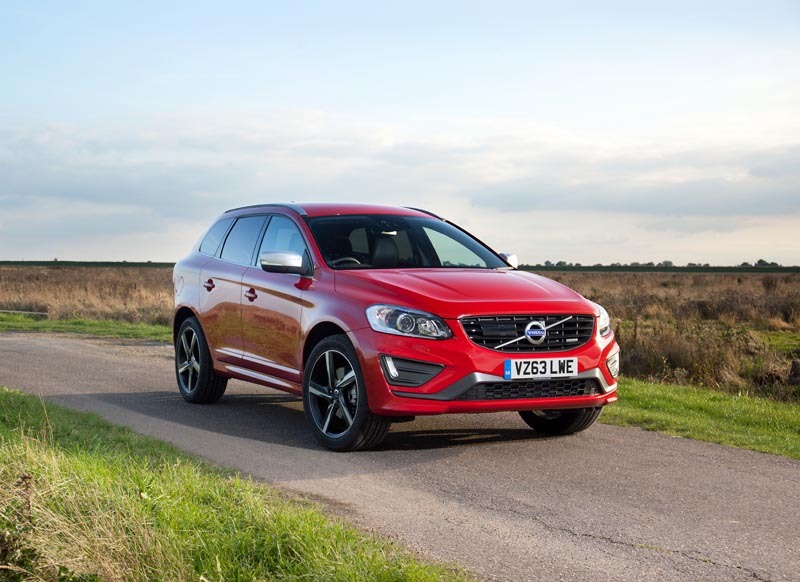 R-Design models ride on a stiffer chassis set-up than conventional XC60s, and while this can make them ride rather harshly on some surfaces, the benefit is a truly surprising enthusiasm for corners. Hustle the XC60 through your favourite series of twisties – a job made easier by steering that offers more feedback about the texture of the road than you might be expecting from an electrically-assisted set-up – and you’ll be greeted by little in the way of body-roll and a genuine feeling of tenaciousness that belies the XC60’s size. If Volvo wanted to imbue the XC60 with a set of capabilities likely to appeal to younger buyers, in R-Design spec at least, they’ve succeeded. Technology is rapidly becoming a Volvo strong-point, and you can order your XC60 with an astonishing array of sensors and driver aids. All XC60s are fitted as standard with Volvo’s latest City Safety system which can automatically apply the brakes at speeds up to 31mph to avoid a collision. 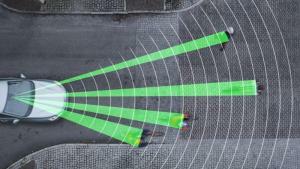 This can be expanded upon by adding the £1,900 Driver Support Pack which includes Cyclist and Pedestrian Detection, Queue Assist for automatic models, Lane Keeping Aid on D4 models which uses steering feedback to keep you in your lane, or Lane Departure Warning on other models, plus Driver Alert Control, Road Sign Information Display, Blind Spot Information System and Cross Traffic Alert. It also adds Volvo’s excellent Adaptive Cruise Control that maintains a set distance from the car in front, applying the brakes as necessary and even slowing to a stop and pulling away again on automatic models in stop-start traffic. One final addition is Active High Beam Control. Normally these systems use front-mounted cameras to detect vehicles in front or approaching, switching from high to low beam automatically. 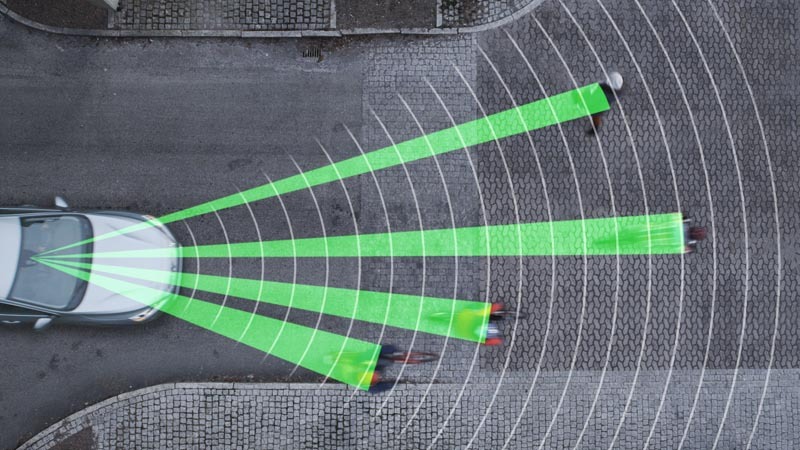 Volvo’s system takes that further by not only coupling it with xenon headlights that swivel to follow the road, but also by shading out part of the beam pattern to avoid dazzling other drivers. In effect, that allows you to drive with permanent high beam without upsetting anyone else on the road, and I have to say, it can be quite mesmerising watching the headlights adapt their pattern as cars approach. Prices for the Volvo XC60 start at £31,260, with our D4 R-Design test car starting at £33,735. 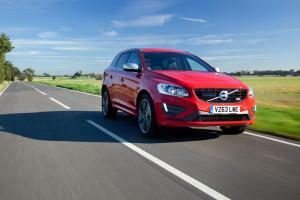 Volvo raided the options list for our car, adding just over 10 grand’s worth of extras to take that to £43,895. That’s something that’s surprisingly easy to do, given the truly vast array of goodies available to tempt you. There’s even an exterior paint finish called Twilight Bronze.